The all new M4 Irons are the result of TaylorMade's painstaking hours of research, engineering and design. TaylorMade harnessed every ounce of technology and focused them into one single-minded goal; building the longest, straightest, most consistent irons in the company's history. 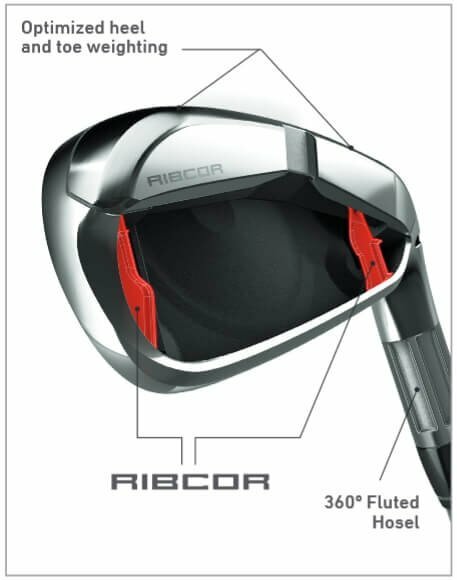 The biggest technological breakthrough with the M4 irons is the introduction of RIBCOR. By placing two lightweight, high-density ribs at the heel and toe of the iron, TaylorMade has reinforced the perimeter of the club head and increased it's structural rigidity. This in turn allows TaylorMade to localize face flexibility, meaning more energy, ball speed and forgiveness across the hitting area. RIBCOR actively stifles flexibility in the toe, creating a tighter shot dispersion. As an added bonus, RIBCOR makes the M4 irons sound and feel better at impact. Other improvements include: The implementation of the thinnest face (1.5mm) TaylorMade makes. Decreasing thickness increases spring and ball speed. The M4 Irons have increased MOI through optimization of heel and toe weighting, resulting in increased forgiveness. A thin leading edge, that combines with TaylorMade's speed pocket, to raise ball speed on low-face shots. And finally, a weight saving fluted hosel and 360 degree undercut that allow TaylorMade to redistribute mass to the bottom of the club. 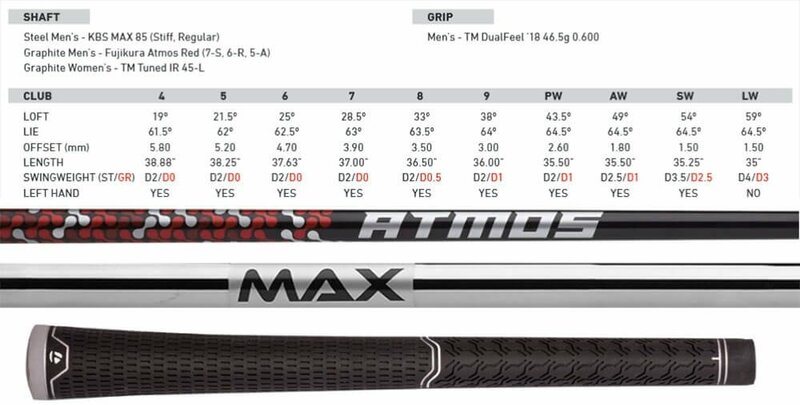 The shift in weight maximizes launch distance and consistency. With the new M4 irons, every golfer is afforded the opportunity to benefit from TaylorMade's monomaniacal pursuit of golfing perfection. First time order...have been back once again and will continue to come back! Taylormade irons are excellent irons for me. Head view is not too bulky. I use the KBS85 regular shaft and Golf Pride mid grips CP2 black/blue. Original grips on club did nor fit my hands nor were they of the quality I like. Carl’s delivery time was excellent as usual. Good looking, good feel, good results with these irons so far. Great clubs and excellent service as ususal.